Happy New Year! Welcome to the first Tongariro Times of 2016. I hope everyone's first week back at work hasn't been too much of a scare...or if you're one of the lucky ones, you've yet to make it back?! Summer here at Project Tongariro has been a rather busy one! The Mahi Aroha Summer Programme kicked off with our annual Kite Day held on Chateau Tongariro's golf course on the 1st of January surrounded by the wonderful landscape. This day is always a highlight for families and visitors alike. The programme has also seen people hiking, biking, and exploring caves and volcanoes in our amazing region. The last event on the Mahi Aroha Summer Programme is our very own Tussock Traverse to be held Saturday 30th January (Auckland Anniversary Weekend). Project Tongariro is the charity partner for this event and we provide all the friendly marshals. We are still in need of a few, so if you're interested, please drop me a line on kiri@tongariro.org.nz ASAP. Friday and Saturday night accommodation is offered, as well as a packed lunch for the event day. The post-event celebratory dinner to round an excellent day off! All [first time] marshalls will be required to attend the safety briefing on the Friday evening. Also offered this year on the Friday evening is an unique opportunity to listen to a Astrologist interpret the night's sky from the balcony of Chateau Tongariro, and local kaumatuata's talk about the region's cultural values. partipate in conservation presentations on a wide variety of topics from plans to reintroduce weka to Mt Pihanga - Lake Rotopounamu to stories about the Molesworth Station. a chance to enjoy the company and experience of like-minded people. Visit to Wairakei Golf and Sanctuary which is a kiwi creche and home to a pair of takahe and their chicks. Briefings on development programme and whio recovery. Thursday 17th March 2016 - Visit Lake Rotopounamu Restoration Project with miscellaneous work tasks including heather control at Mt Pihanga (restricted numbers and fitness). Friday 18th March 2016 - Weed control Lower Waipakahi Valley Kaimanawa Forest Park including visit to sites of interest on the way. Saturday 19th March 2016 - Waihohonu Historic Hut visit and maintenance. Sunday 20th March 2016 - Planting Te Matapuna Wetlands (3 hours). This is a DRAFT programme and will need to be flexible due to weather conditions. There could be an option for some people to travel to Ohakune to help construct a boardwalk over a wetland. There can also be flexibility re physical fitness with jobs like plant releasing and planting. Talks or presentations will added to the programme. A refined programme will be made available at the end of February. Meet Hannah Meredith and Tim Jonas-Plaisted. They are our interns this year, and they are currently enjoying themselves working in and around Mt Pihanga-Lake Rotopounamu and the Te Matapuna Wetlands. They've been doing a variety of work, including bird monitoring, willow monitoring and killing, tracking tunnels, checking predator traps and helping the Fresh Water Threats Didymo Team at Taupo events, and helping Nick Singers with Whio monitoring on the Waimarino River. Next week they are off up to the DOC Whakapapa team where they'll be kiwi catching, checking traps and tracking tunnels and more. They will also be helping out marshaling at the Tussock Traverse. Hannah and Tim will be with us until 20th February when we will farewell them at our annual 'Volunteers BBQ'. The forest restoration project at Rotopounamu - Mount Pihanga has been going from strength to strength. Special thanks to the wonderful public support we receive through our Adopt a Hectare campaign, and private funders such as the Pharyzan Trust. Throughout the year our local volunteers and interns are busy checking traps and maintaining the monitoring through tracking tunnels. Between 1st January to 1st December 2015 - 40 stoats and 69 weasels were caught at Rotopounamu! The exciting news and top priority for 2016 is the plan to re-introduce North Island weka to the area. 20 wild birds each year over three years will be sourced from suitable locations. Project Tongariro will employ a qualified person experienced with handling native wildlife to manage this project and they will be supported by experienced volunteers. Keep tuned for further updates on this exciting step! The year, the Animal Health Board is increasing pest control for possums and Project Tongariro will continue management of over 250 traps which control mustelids (rats, stoats, weasels and mice) keeping these pests to low levels. Since 2003, Project Tongariro has worked to improve biodiversity at the site in partnership with the Department of Conservation. Rotopounamu isn’t one of DOC’s official ‘mainland island’ projects, but it is the most significant forest restoration project in the Taupo catchment. There is no pest-proof fence around the 1200 hectare area, instead, predator traps targeting stoats, weasels and ferrets have been laid out in a grid enabling an intensive and sustained pest-control programme. Bait stations are also used to target rats and cover an area of almost 600 hectares. The traps are cleared by an enthusiastic team of local volunteers who check them regularly during the spring and summer bird-breeding season. Such is their enthusiasm, one of the lines are cleared year-round. There is even a keen group who regularly travel from Te Awamutu to do one of the longer lines (5 hours). The rats and stoats have been hit hard and many bird species have made a comeback. The vision is to reintroduce native species such as brown teal and weka. Rotopounamu is easily accessed from the Pihanga Saddle road (State Highway 47). The scenic, five kilometer loop walk around the lake offers lots of bird watching opportunities. Tui, fantail, rifleman, silvereye, whitehead, North Island robin, kākāriki and kaka can be seen often. About 170 people currently make annual donations to the Rotopounamu project through the ‘adopt a hectare’ programme . 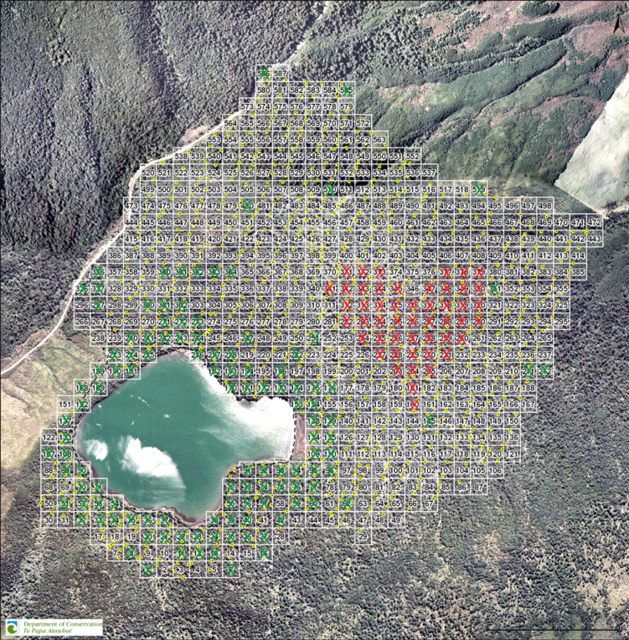 A heart-shaped block in the bush surrounding Lake Rotopounamu has been sponsored in memory of two young park staff. Derek White and Marie Williams became engaged (to be married) at Rotopounamu early in 1982. Tragically, they died later that year in a helicopter crash on Mt Ruapehu. On the 30th anniversary of their deaths, members of both families adopted 50 hectares, on an ongoing basis, as a living legacy to their memory. It costs $100 a year to adopt a hectare and there are still many hectares available. If you would like to help us restore the dawn chorus at Rotoponamu, go to our website - Adopt a Hectare. Check out the Tongariro Journals Library- 1999 to 2015 Journals online now. The smartphone APP guide to the Tongariro Alpine Crossing.